The specified file public://inline-images/https_%2F%2Fs3-us-west-2.amazonaws_23.jpg could not be moved/copied because no file by that name exists. Please check that you supplied the correct filename. EU ministers agreed to binding cuts in CO2 emissions of 35% by 2030. 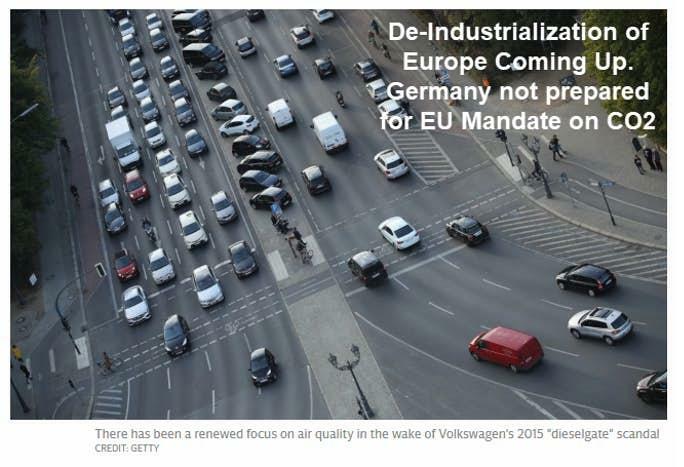 The German auto industry won't be able to deliver. The Telegraph reports Berlin court orders German capital to ban most diesel vehicles on 11 major roads to counter pollution. Hamburg was first in May. Stuttgart, home of Mercedes and Porsche, was second in July. A diesel ban in Frankfurt came third. Only older cars that do not meet emission standards are banned, but diesel is now toxic. No one wants to buy diesel. Adding to the woes, Merkel has lost control. She is no longer able to protect German industry. The European Parliament just voted to cut CO2 emissions by 40%. The European ministers voted for a 35% reduction. The latter is binding. Car sales dropped sharply in September. The German government - backed by its usual eastern European allies - fought in vain to head off the tougher standards. Germany’s environment minister Svenja Schulze deliberately - and astonishingly - weakened her own negotiating position by making clear that her personal preference would have been for tougher targets than those she was officially defending as her government’s position. An administrative court in Berlin decided yesterday that the city of Berlin needs to ban diesel cars - compliant with Euro norms five and earlier - in important areas of the city, including Friedrichstrasse and Leipziger Strasse. There is no ban for petrol cars as the emissions in question are nitrogen oxide. The ban will have to be implemented by July 2019 at the latest. The plaintiff was a German environmental NGO, which had sued for a city-wide ban of diesel. Sueddeutsche Zeitung quotes the head of VW as saying that the number of jobs in its German factories will fall by 100,000 in the next decade, an estimate we still consider relatively optimistic. Now that cities are imposing diesel bans, the car industry’s plan B had been to step up production of petrol cars, but this strategy is now double-crossed by the new CO2 emissions targets. FAZ thus calls the decision a quota for electric cars. While this is technically not correct, it has a similar effect. It is a development the German industry had sought to avoid because it is not one in which they have a natural leadership. We would add to that a forecast of our own: the import quota for cars will have to rise substantially for the EU to meet its own emission standards. This will become of the biggest factors driving the inevitable de-industrialisation of Europe - a socio-economic shift which nowadays has widespread political support but for which the EU and its member states are not prepared. Germany is years behind the US and China when it comes to producing electric cars. It is also years behind the US on self-driving cars. Eventually, Germany will catch up, but that may take many years, if not a decade. This is what happens to cheaters when politicians can no longer protect them.